The adult coloring book trend has been building up steam for a while now and seems to have reached full speed ahead. The number of coloring books available these days is astonishing given that only a couple years ago the only way an adult was going to be seen coloring was if there were small children present. On my plane ride to Albuquerque this summer there was a woman with one of the garden coloring books who spent the entire 2 1/2 hours happily coloring and chatting with her companions. I have given coloring books as gifts to adult friends. I have yet to try one myself. Until now. When the publisher contacted me and asked if I would like to try out Dream Mandalas I thought about it for a day or two. Is this really something I wanted to try? I loved coloring as a kid, but do I want to do it as a adult? But then I thought, well why not? Maybe there is something to it. After all, what have I got to lose? Dream Mandalas arrived and what a nice little book it is too. So much fancier than the coloring books I had when I was a kid. The paper is thick and the pictures are printed on only one side of the page. This is really nice because there isn’t any bleed through from the design on one side to a design on the other side. Good as the paper is though, I wouldn’t use markers on it, but I have never been a fan of coloring with markers anyway. The designs are varied and often intricate. Animals, people, things, abstracts. You will want to make sure your pencils are sharp! designs before doing a post about them, how long could it take after all? Turns out, quite a long time! I still haven’t finished the dragon I started on. Unlike when I was a kid with my box of Crayola crayons and pictures that were simple with large single-color areas to cover, these designs take time. And instead of just grabbing any old color, I find myself contemplating the whole picture and considering color schemes and effects. The coloring itself is pleasurable and relaxing. I thought I could do it while watching television but I get so focused on the coloring that I don’t pay attention to the TV. I also found I enjoy coloring for short bursts of time, no more than 30 to 45 minutes. After that I start to get sloppy. Since coloring with the TV didn’t work I tried putting on music and found that was a marvelous idea. And it doesn’t matter what sort of music, pop, classical, folk, they all work as a soundtrack. I’d call the whole undertaking a success and understand now why it’s become a thing. It’s a relaxing chance to play with color and feel like you are doing something creative. Plus it is just plain fun. If you loved coloring when you were a kid and haven’t tried one of the new coloring books yet, give it try! And if you can’t decide which coloring book to choose from, allow me to recommend Dream Mandalas as a possibility. I’m really enjoying it and I’m sure it will provide much pleasure through the winter months, perhaps even more than it has during the summer. I was given a colouring book when I was in the hospital. Some of the designs were intricate but most were floral, like fabric. I could not help but think that I would rather be reading. I gave it to my 22 year old daughter. With her jerk of a boyfriend she sure needs the stress relief. I agree on the computer games. I know that when I have not been functioning well I could spend hours zoning out on Spider Solitaire (shows my age perhaps). At those moments a very cool colouring book like the one you have would likely be most therapeutic. Yup, when I am tired and my summer allergies are bothering me I could spend a very long time playing jewel fever on my iPad! My big boy is too old to color, and my little one too young so no more coloring books in our home… I can see it as a great stress help, but conditions need to be right (some uninterrupted quiet time alone, I guess). I’m on the fence about this (like roughghost said, why not read some more?). Somehow, I would be a bit awkward to do it in public, like in a café, where I usually go to have this quiet time alone. What do you think? I think adult colouring books are a lovely idea. I’ve never seen one here (Australia) but that’s probably because I haven’t been looking in the right places. Dorothy, it’s a pleasant way to spend time 🙂 The big bookstores in the US sell them and of course they are available online at Amazon and Book Depository has them too. Oh, I”ve seen them here Dorothy – at the National Library Bookshop and other stores in Canberra. Often on or near the counter! You clearly aren’t easily attracted by such obvious marketing! I’m not sure it’s for me, but I can certainly understand how it would be a calming activity. True, I do say “never say never”! I bought a few adult coloring books myself just before this recent hype. My husband gave me a bit of good-natured ribbing. Then, ET did a column on adult coloring books and then Amazon listed these books amongst their best sellers. I guess I was right on trend without meaning to be. It is a great stress reliever for someone like me. I have never been able to just watch television. I have to be doing something else, whether I am on the computer, doing cross-stitch, jigsaw puzzles, or now coloring. Meditation is highly recommended, but for those of us who cannot imagine just sitting there with our thoughts, coloring is an alternate form of meditation. It also beings back happy thoughts of my childhood. Like most, my childhood wasn’t all happy, but the times I spent coloring Disney princesses were happy times for me and now I can color within the lines. My kindergarten teacher would give me a gold star. Lynnette, you trend setter you! I am usually knitting when I watch TV or exercising, things I don’t get so completely absorbed in that I can’t divide my attention. Yes! Disney coloring books! I had a Pooh Bear one and that was my very favorite. Heh, coloring inside the lines is definitely much easier than it used to be. Yeah for developing fine motor skills! This I HAVE to get!! I still have some awesome coloring crayons lying around, now this is just the place to use them in!!! cirtnecce, it’s fun and relaxing and the designs in this book are really nice and allow you to be as fancy or simple as you feel like. Have fun! I need to get a good big set of colored pencils so I can do some more coloring. I’ve been doing it with markers, which is a lot of fun in a lot of ways, but it’s rough when you have a LOT of one color in one place. I did buy myself a couple of colouring books as I wanted something to do that wasn’t reading, but was still peaceful and contemplative. 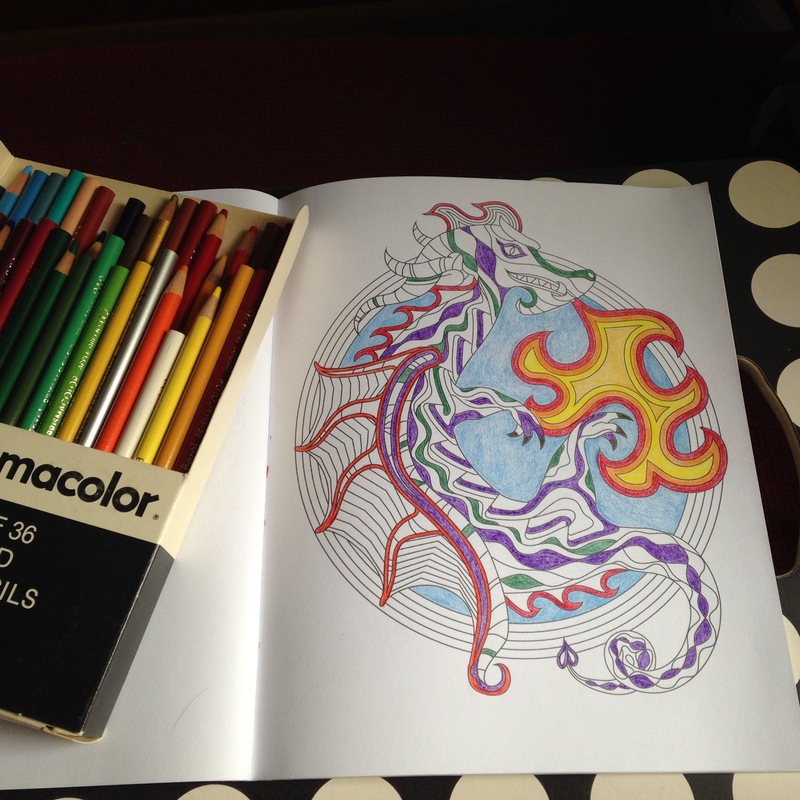 I don’t enjoy it quite as much as I did when I was a child (and adored colouring), but it does make a nicely different activitiy, and a good thing to do while listening to audio books! Love your dragon – very cool. Litlove, Thanks! 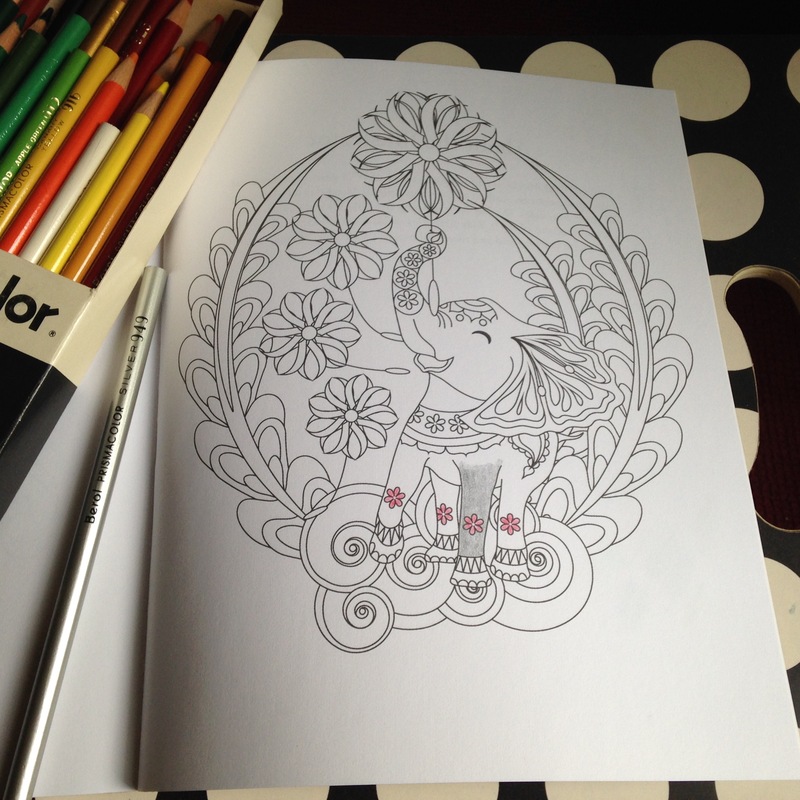 I hadn’t though of coloring while listening to audio books, what a great idea! Coloring isn’t quite like when I was a kid either and could spend hours at it, but it’s a pleasant activity to have on hand. Danielle, I bet you’d really like one! And yeah, there are so many to choose from these days you can’t go too wrong. And it is something that is easy to pick up and put down and leave for weeks and not feel guilty about. It’s pure fun and relaxation with not purpose and deadline! Huh. I have watched this whole adult coloring trend with great suspicion from afar. I can’t imagine having time for it, is the main thing. But I can see how it could be relaxing and meditative. Glad you enjoyed it. Nikki, I don;t have a lot of time for it frankly. But it does fit nicely into spare moments that are too short to much and too long to not do something. I’ve seen these coloring books popping up in art stores and have been intrigued. I like to do my own artwork so, like a previous commentator, I was a little suspicious. But I find them really beautiful and inspiring and can see the value as a meditation method for those who, like me, always have to be doing something with their hands. Hello! I really enjoy your blog and am just catching up to it after coping to medical issues with my hubby. Several years ago I thought to this to cope to my own medical issues, I bought pencils, but could not find the books other than children’s books and was not able to really look, so the pencils were put away, until recently when I thought again to this outlet… I was able to get out to Barnes and Noble with my son and his wife and as we walked in the entrance, an assortment of adult coloring books… Wow! How did they know? I did not know it was a new trend at all, as while I do read many books regularly, these ongoing medical issues prevent me from getting out much and I rarely am ever aware to new trends… But apparently now, I am in the trend… It does take time and concentration, but it is relaxing… Some tea, my favorite music…nice!